Last week legendary psychedelic poster artist Alton Kelley passed away. Kelley was best known for defining the unique styles of the album covers and posters of the Grateful Dead and Journey. He was one of the best known of the artists to come out of the San Francisco scene of the 1960s who got their start designing posters for concerts at the Fillmore. His style was distinctive, and while he may not have been as diverse and productive as his contemporary Rick Griffin, his designs for the Grateful Dead were probably the very best known of the era. 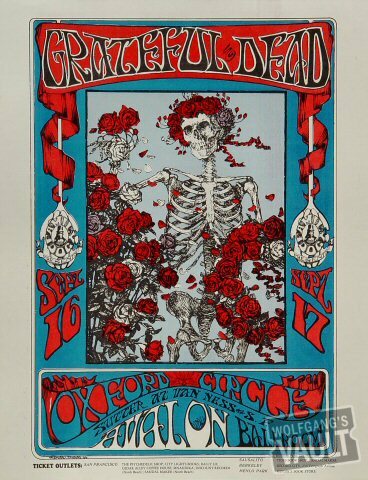 His skeleton with roses motif, which draws on the designs of Edmund Dulac, is probably the single most recognized graphic design theme to come out of the psychedelic era. Like the other poster artists of the psychedelic period, Kelley drew on font designs from the Art Nouveau period for inspiration. A number of psychedelic poster fonts derive from hand drawn styles used by Kelley and his contemporaries. Particularly characteristic of Kelley’s style are the Pantagruel, Bad Acid and Hendrix fonts. Kelley’s illustrative work was also influenced by artists from the Art Nouveau period, particularly poster designer Alphons Mucha. Kelley’s work was a continuation and augmentation of the genius of earlier eras and artists, and his work will live on as part of the legacy of one of the most interesting American movements in the design arts. There are a number of good, profusely illustrated books on the psychedelic poster art period available on Amazon . Particularly notable are High Art: A History of the Psychedelic Poster and The Art of the Fillmore .